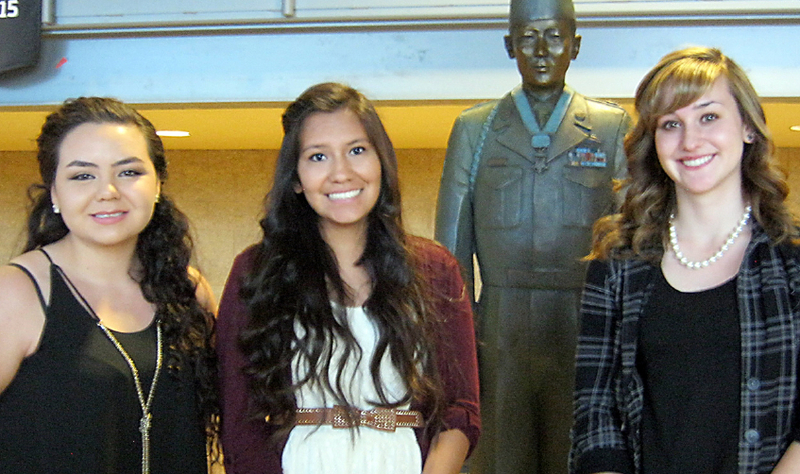 Scholarship recipients Alexandria Monjoy, Jennifer Begay and Kelly Radcliff with statue of Hiroshi “Hershey” Miyamura in Gallup, N.M.
GALLUP, N.M. — Three scholarships in the name of Korean War Medal of Honor recipient Hiroshi “Hershey” Miyamura were given on May 13 as part of the fifth annual Senior Recognition Night at Hiroshi Miyamura High School in Gallup, N.M. The scholarship recipients were Jennifer Begay, Alexandria Monjoy and Kelly Radcliff. Begay, a Native American, plans to study biology at the University of Utah. Monjoy was one of the top ten seniors in the class and will major in health sciences at the University of New Mexico. Radcliff plans to study dance at Arizona State University. The award ceremonies were held in the school gymnasium, where there is a mural on the wall donated by the 2013 class depicting a service person from each branch of the military and America’s major wars. Included is a painting of Miyamura armed with fixed bayonet that was reproduced with permission from the Medal of Honor Society. A meeting was held with Gallup McKinley County School Superintendent Frank Chiapetti to inquire about the status of the JROTC application at Miyamura High. Chiapetti was the first principal at the school and applications were submitted to all four armed service branches when the school first opened. He stated that since Miyamura’s wife Terry passed away last December, the opening of a JROTC program is urgent and he hopes to obtain application status promptly. At the start of World War II, Miyamura said, he joined the Army JROTC at Gallup High School to obtain familiarization about military conduct. He received the Medal of Honor while serving in Korea with H Company, Seventh Infantry Regiment, Third Infantry Division. 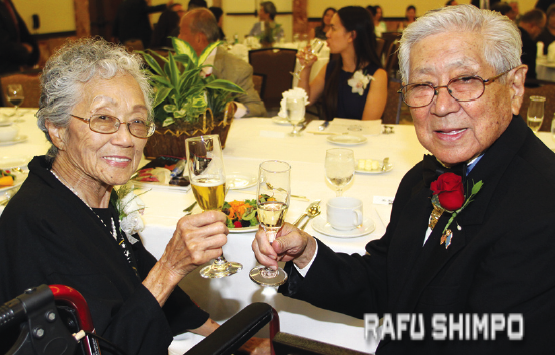 He was awarded the medal in 1954 by President Dwight Eisenhower and since then has been representing the Japanese American community to the greater American public. An expression of gratitude to him and in memory of Terry Miyamura can be made by contributing to the Hershey Miyamura Scholarship Fund in care of Gerald Herrera, Board Member, McKinley Education Foundation, 1127 Boggio Drive, Gallup, NM 87301.